In late summer, my wife Maureen invites me to join her for a "data camp" in San Francisco for 9 days. I readily agree despite being in the middle of preparing a manuscript for my first book to be published in a few weeks. The amusing coincidence, as I try to read and edit my manuscript in a 2 square foot space, is that as I am reading a portion of the book where I am disparaging the ugly sprawling mess known as Houston, I happen to gaze out my window and see this city of misery below us. In all directions, the city stretches and sprawls as far as the eye can see. Like the traffic congestion that Houston residents must face 24/7 in their doomed urban area, our plane begins circling over the airport for 30 minutes due to a thunderstorm passing over the area. Finally, we "deplane" at our gate (E11), and are told we have 15 minutes to get to our connecting flight. The connecting gate is Concourse F. Must be a few feet down the corridor. To our horror, we discover that it is a 4-mile walk, which we are informed of by an extremely helpful airport staff person who picks us up in her cart and whisks us to our gate (screaming all the way for pedestrians to CLEAR OUT OF THE WAY OF THE CART). Somehow, we arrive just in time, as the passengers are lined up and boarding the airplane as we arrive. The rental car center we must get to once we arrive at the San Francisco Airport turns out to be much like the immense distance ordeal of travel in the state of California. To get to the center WITHIN the airport, we must take three train rides, long walks, and escalators from our gate. Of course, while we somehow made it to our connecting flight in Houston, our BAGS did not. Being an insomniac on Eastern Standard Time, I'm up at 5 am the next morning to get in a few more hours on the manuscript. (I read comments I have previously made about the merits of travel in San Francisco as I look out my motel window at San Francisco Bay. Spooky.) Incredibly, our bags arrive when we go to look for them at the airport first thing in the morning. We drive for most of the day through the surprisingly arid, agricultural central California region on our way to Kings Canyon National Park. Being in car-happy California (another observation I've previously made in my book), we are completely unsurprised by the many monstrously wide roads we drive within a sea of a manic blur of cars. 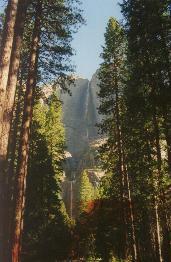 We drive into Kings Canyon and Sequoia National Forest. Route 180 takes us down into the Kings Canyon floor-built by convict labor in the 1930s. The road is exceedingly winding, which makes travel slow-going as it clings to the sheer cliffs. Before us, the canyon walls are stunning. Spectacular. Immense. Enormous granite cliffs (photo at left). The sequoias tower over us like sentinels. That night, we set up our tent in a family campground at the bottom of the canyon. Sequoia and Kings Canyon National Parks are the little-known southern neighbors to the overwhelmingly popular Yosemite National Park to their north. These relatively little-known parks offer comparative solitude on about 800 miles of gorgeous backcountry trails. Next morning, we drive back up Route 180, ascending out of the Canyon. We stop frequently to gape, open-mouthed, at the DEEP canyon below us, where a raging river flows. With a depth of 7,000 feet, this gorge we look down into is the deepest in the United States-deeper than the Grand Canyon. Our first stop is the General Grant Sequoia Tree (a 3,500-year old tree known as the "nation's Christmas Tree") and the General Lee Sequoia Tree-utterly and impossibly gigantic trees. 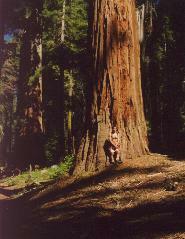 We also visit the General Sherman Sequoia Tree, which is believed to be the world's largest above-ground living thing (47,450 cubic feet of lumber, 102 feet around at the trunk base, 275 feet tall, and weighing over 1,385 tons). Based on an excellent recommendation from a park ranger in Kings Canyon, we make last-minute changes to our hiking plan. On his advice, we opt for a 6.5-mile hike in the Redwood Mountain Grove. The advice turns out to be excellent. The Grove is superlative. I am unable to resist the urge to continuously shoot photos of these HUGE redwoods which dwarf us as we saunter through them ("sauntering" is the Thoreau-recommended method of travel). The forest is utterly silent due to the enveloping trees and their pleasant-smelling needles blanketing the floor. During our three hours of hiking this trail, we see only one or two other hikers, which meant that we essentially have this wonderland to ourselves. Redwood Mountain Grove contains the world's largest grove of redwood trees (that's me in front of some kindling wood to the right). Our afternoon adventure starts at 3:00 pm. Again, we have gotten superb advice from a park ranger about the hike we should do. 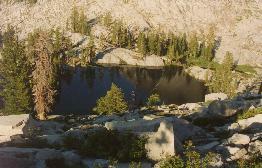 It is to be the Pear Lake Trail for our overnight backpacking excursion. The shocking news we get at the backcountry permit office is that a month before, wilderness permits have increased in price from free to $15!!!! We had informed the ranger, in seeking to identify the trail to hike, that we were "Florida Flatlanders" and were not acclimated to the steep elevation changes in the west. Two different rangers assure us that Pear Lake is "Moderate". "Only 2,000 feet of elevation gain." "Easy." Indeed, soon after we set out, we pass a hiker coming out, and he informs us that the trail "levels out" eventually and is not ALL uphill, as the beginning few miles have suggested to us. Apparently, non-flatlanders have differing definitions than Floridians for what constitutes "moderate" and "level." Our hike this day turns out to be 4.5 grueling hours of hiking-all of which is uphill. In the dry heat of the Upper Sierras. We cross lots of hikers heading out-many of whom are red-faced and seemingly overjoyed that their ordeal will soon end. Nevertheless, our hike is unforgettably spectacular. On the advice of a number of people in the park, we choose the "Watchtower" trail route, instead of the paralleling "Hump" trail route. The Watchtower trail rewards us by bringing us to the namesake Watchtower cliff and valley. The valley is ENORMOUS. And we looked out upon the valley only a foot or two from a VERY steep cliff, which abruptly drops about 2,000 feet to the floor. It takes all of my courage to creep toward the edge of the cliff and look down (on my hands and knees, for safety). I'm not ashamed to admit that I am afraid of THOSE heights, as I look over the precipice. But I quickly point out to Maureen that I'd LOVE to someday have the opportunity to paraglide from the cliff into the valley. "Think of the hours of hang-time you'd have!!!" At long last, with not an ounce of energy remaining in our tired legs and backs, we reach the trail end and campsites at Pear Lake. The site is extremely unusual and impressive (see photo at left). Surrounded by very high, very steep granite walls, it is clear that our camp site sits in the bottom of an ancient volcanic cauldera. The granite surface of the camp area is polished smooth, indicating previous glacial action. It was as if we were camping in a lunar landscape. I conclude here that "clustered camping" has its downsides. While it was handy to have a close-by restroom and fellow campers in a remote wilderness, I would prefer a more primitive, dispersed backcountry camping experience (with no other campers anywhere near us) to truly feel as if I am in a wilderness. In our hikes this day, we are surprised to have six very close encounters (arms-length away) with deer. On our way out of Pear, we find ourselves walking behind two adolescent bucks with large antler racks. They casually walk in front of us for 10 minutes, as the narrow trail has a steep wall on our left and a steep cliff on our right-no where for the deer to go to escape us. We drive to Yosemite once back from the Pear Lake backcountry. Incredibly, we find a motel room about 30 miles south of the park for the night. The next morning, despite utter exhaustion, we are up at 5:30 am, knowing that an early start in Yosemite Valley is crucial to avoid the daily summer crush of tourists. At 2,425 feet, it is the highest falls in North America, and the fifth highest in the world. 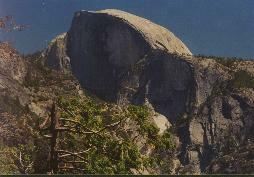 We head for Upper Yosemite Trail via shuttle bus (I had forgotten which trail I had done in 1994 that was so gorgeous. Wanting to show Maureen the trail, I guess it is Upper Yosemite, thinking we'd get to the "gorgeous part" about 300 feet up, instead of having to punish ourselves to reach the top 2,700 feet above the valley floor.) My plan is to hike to the relatively easy one-mile mark and look for familiar signs that this is the trail I enjoyed so much 10 years ago. But at one mile, no bells of recognition are ringing. We mutually decide to press on, and before we know it, we eventually reach an elevation at which we say to ourselves, "We're within striking distance of the top of the falls, and we've put so much effort into getting this far. Let's go for the whole enchilada." "Top of Falls" signs point us to the top as we reach the summit. Below us (WAY BELOW US) is the Yosemite Valley, where monster tour buses look like tiny ants. Dare we approach the terrifyingly steep falls closer than, say, 100 feet??? We decide we've made it this far, so why not risk our lives? So we inch closer. I am so nervous that I start to hyperventilate. My knees start to wobble. I nearly get on my hands and knees to feel like I will safely reach the top of the falls without falling OVER THE EDGE-even though I'm still quite a way from the dreaded falls precipice. Along the narrow trail, there is a metal railing at the edge of the cliff leading to the falls. With both hands, I grip the railing white-knuckled. I am leaning strongly away from the DROP-OFF to convince myself that I won't go hurtling over the edge to a screaming, somersaulting death. All along this horrifying crawl, blinded by fear, I am very careful NOT TO LOOK DOWN AT THE VALLEY 2,700 FEET BELOW. By not looking down, I can maybe fool my brain into thinking that I am not standing inches away from the most frightening and menacing cliff I have ever been near. I yell back to Maureen, "Keep a strong grip on the railing!!!!" in a pathetic effort to comfort her (and me). Gusts of wind become fearsome, hurricane-like gales promising to sweep us to our death. There is no margin for error. We get to the very edge and are able to see the river water just as it vanishes on its mad, thunderous plunge straight downward to the Valley floor thousands of feet below. Backtracking, with a feeling of relief, we go upstream to enjoy cooling our feet in the stream water and sit down in the shade for lunch. The setting is very quiet and pleasant-in stark contrast to the frenzied falls of doom a few hundred feet downstream from us. Nearby, a sign reads, "Don't fall into the river. There is no second chance." We head back down the trail. With depleted water supplies, we must be careful to ration the water as we descend. It is a mere 1.5-hour descent time for this 6.8-mile (round-trip) trail. Re-boarding the shuttle, our driver is clearly a veteran driver who has been through the "tourist wars." He takes no crap from ANYONE. His voice amplified by the on-bus intercom, he sternly and repeatedly commands that the bus will not move unless people stand behind the yellow line on the sardine-packed vehicle. At one point, he comes upon two pick-up trucks parked in such a way on the shoulder of the road that the bus would be forced to cross the double-yellow line in the middle of the road to get around. He calls in to the shuttle bus station to inform that the bus is not going anywhere until the trucks are moved (illegal for a commercial bus to cross such a line). So we sit. And sit. For 20 minutes. In a crowded, stuffy, hot bus full of impatient tourists. More than once, he calls in violations by buses that squeeze by us going in the opposite direction. Finally, a deputy arrives to direct traffic and allow the bus to maneuver around the trucks. The driver returns to his on-going admonishments of boarding passengers who are not behind the yellow line, or try to board after he has announced the doors are closing (he closed the door on a few unhappy hikers, who became wedged in as the two doors clamped down on them). We go back to Yosemite Lodge to check for vacancy. Fighting fatigue, we now have a desperate need for lots of sleep after an exhausting hike that was "just too much." There is, of course, no vacancy at the lodge. "No problem," we say. "We'll just drive to a town 1.5 miles away for a motel room later. We eat lunch, then take the short walk to Mirror Lake. The lake is seasonal, and it is only a trickling stream when we go to see it. Finally, we drive to Glacier Point. Here, 3,214 feet above the Valley floor, the full, panoramic view of Yosemite is in front of us. The waterfalls. The canyons. 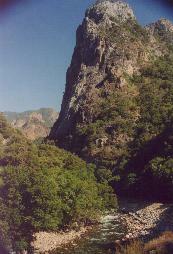 The rocky pinnacles. We arrive just in time for the stark view of Half Dome in its glory as it is bathed by the fiery sunset. About 150 tourists are gathered here as we arrive, as if attending a religious ceremony in a church. And in a way, it is precisely that. I have misjudged our time, and it is not until 8 pm that we leave the park-having abandoned our overnight backcountry hiking plans due to the unforeseen Death March to the top of Yosemite Falls, which drained both our energy and our time. Utterly exhausted and physically banged up, we head for the first town west of Yosemite-Mariposa-which is 20 miles from the park. I'm shocked to learn that on this weekday night, there are no rooms available at ANY of the many hotels in the town. We go to The Pizza Factory for a couple of calzones, and to regroup. We decide to head 38 miles west to Merced. But even there, almost 60 miles west of the park, every hotel and motel is full. Finally, after checking approximately 30 motels, Super 8 Motel has some rooms available. There, we settle in, after deciding we will abandon our final day at the park, for a well-deserved shower and slumber, at 1:30 am. Upon arising the next morning, we set out for San Francisco. We have a number of hours to spend before needing to check in at the Hilton in SF. 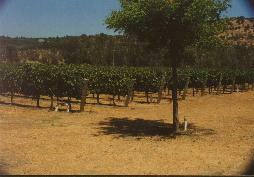 We choose Napa Valley for some wine-tasting and picnicking (photo at right). Stopping at a funky, character-filled grocery, we stock up on some fresh Italian Country bread, two exotic cheeses, and some fresh Greek olives. We sample Cakebread, Frog's Leap, Clos Duval, Raymond, Round Hill, and Freemark Abbey. Most of what we sample is delightful. From this auspicious group, we select our six favorite wines to carry back to Florida-mostly Cabernet. Time has run out. It is now a mad dash to beat the SF rush hour traffic-which we fail to do. We are snarled on Interstate 580 just before the Bay Bridge. But at long last, we reach the airport to dump the rental car, which now has over 1,000 miles more on it than when we picked it up a few days earlier. An experienced cab driver whisks us to the downtown Hilton where we settle in for the night. Maureen heads for the first day of data camp meetings with her colleagues. I am picked up by an old high school buddy at the hotel. He drives manically and ragefully (he is a former cab driver in the area, as it turns out) to his home in Sausalito to give me a taste of this bizarre community of 6,000 people. First, he takes me to the "affordable housing" project in town-a neighborhood of floating houseboats at a town dock. Affordable because there are no land costs and no property taxes. We notice, nevertheless, that homes for sale there range between $500,000 and $1 million-affordable by Bay Area standards. We walk to the overtouristed commercial streets in town, and at the "No Name Bar," I have a pint of Anchor Steam beer on draft-my favorite commercial beer, and locally produced in SF. There, he regales me with tales of the laid-back, outlaw nature of Sausalito, where folks casually ignore drug laws in public, and fiercely protect their unique town from any sort of fast-food restaurant, Big Box retailer, or obnoxious signage. There is not a Wal-Mart, McDonald's or a Home Depot to be found anywhere. He also provides a spirited, convincing commentary about the company he directs-Igor International-a "naming" business which clearly does well in selecting company and product names that set them apart from their competition. Later, I join Maureen for dinner at the Tadich Grill, a restaurant highly recommended by a friend in Florida. Located at 240 California Street in downtown SF, it is a favorite of the locals. We discover why. Excellent service, superb meals. I order Pacific Red Snapper and Bay Shrimp. Delicious. We finish the evening by wandering around in Fisherman's Wharf, then take the cable car back to the hotel. The next day starts at 5:30 am. We are up early to continue our New York City Marathon training. We run from our hotel to Golden Gate Bridge. We run back to reach a 10-mile distance, then catch a cable car to ride up the steep Taylor Street hill back to the hotel. Back at the room, I enjoy a delightfully therapeutic Jacuzzi at the hotel to sooth my aching muscles. Afterwards, I complete the current round of edits to my manuscript. I then walk to meet my friend at his office, where we set out to discuss old times and new as we walk through Mission Street, Haight-Ashbury, and Russian Hill. Haight remains as lively and wacky as in its sordid history. Lots of folks on the sidewalks, and lots of shops full of weird curios. Maureen and I finish the day by going to Little Italy on Columbus Avenue. There, on recommendation from the concierge, we walk into Michelangelo's Café. Turns out to be the best Italian restaurant this Italian boy has ever eaten at. We order homemade Pesto Fettuccine and homemade Gnocchi's. Superb. While waiting for our order, our waiter gorges us with fresh bread, fresh olives, and chunks of fresh Parmesan. After dinner, we are given complimentary amaretto cookies. Perhaps the most stunning aspect of SF is this: In a city world-famous for a mind-boggling number of spectacular restaurants serving the best meals I've ever eaten, the prices in restaurants are extremely low. And all this despite a relatively high cost of living in the city. The sunrise on the following day finds me off running the SF streets again for 3 miles. The countdown "Don't Walk" crosswalk signs give me a handy alert at each intersection: "Do I have enough seconds to dash across before being run down by the waiting bus? Am I awake enough to know?" Maureen and I, later that morning, walk to the nearby "light rail," which is a collection of old, restored street cars salvaged from other cities. We let the first car pass us, despite a 30-minute wait, as it is packed with tourists. The next car is nearly as full, but we decide to squeeze in. The ride to our destination three miles away is crowded and barely ahead of walking speed. I will not be a repeat user of the service. 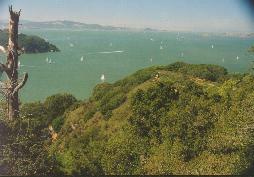 Our plan today is to take the recommended scenic ferry ride across SF Bay to Angel Island. On arrival at the Island, we note an island map showing a spaghetti network of trails. The estimated 4-mile walk is billed as a 2.5-hour distance-fitting nicely into the time we have till the last ferry for the day is scheduled to depart back to SF-or so we thought. We neglect to bring along an offered map brochure showing trails on the island. A deeply regrettable decision, as it turns out. The views along the stroll, at nearly every turn, are panoramic, breathtaking, picturesque views of the Bay, the surrounding hills, and cities (photo at left). A third of the way into our enjoying this, however, also leads us realize two troubling things. First, we find the trail signs unhelpful. We realize we don't know if we are on the recommended route or a path into oblivion. Maureen also realizes that 2.5 hours is NOT available between ferries. With our new, disturbing discovery that we have only 2 hours to return to the ferry dock, we also realize that we've left the beaten path and are on a MUCH LONGER path route. My scenic photography stops end abruptly as we break into a semi-panicked walk-run to return in time for the ferry. In part, this required us to cheat by taking shortcuts down steep, dusty, slippery cowpaths formed by previously hurried hikers. Somehow, we set tourist-carrying-heavy-camera/water speed records to return just as the ferry starts boarding. The ferry passes through a cold, windy fog bank on our return trip-harkening back to the Mark Twain observation that the coldest winter he ever spent was a summer in San Francisco. We fly back to Florida on the red-eye flight. Tired. But in possession of lasting memories.